Because you are a Medical Professional - you are an important member of the Nursing Healthcare Team. You were trained by a team of State of Illinois licensed RNs. You took the time to specifically train for you CNA. You took a State of Illinois Exam. 1. You are now part of an elite team of healthcare professionals who also trained, took exams, and now hold special status in the State of IL. 2. You are now positioned to find jobs in nursing homes, hospitals, home healthcare companies, and private duty. 3. You can work for an IDPH licensed facility or you can be self-employed. 4. You can work as a CNA for the rest of your life, and with full time employment you can have health insurance and retirement benefits. 5. Or you can now start your upward climb on the medical profession's ladder to a higher level - phlebotomist, EKG tech, kidney dialysis tech, blood donation or plasmapheresis tech, surgical tech, nursing school as an LPN or RN, respiratory therapy tech, x-ray tech, physical therapy assistant or PT, occupational therapy assistant, or OT - and more. 6. 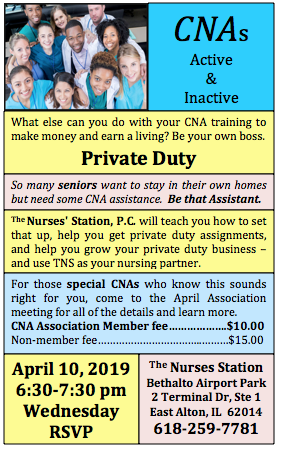 There is even a Rehab Tech advancement for the CNA through the State of Illinois regulations - an additional 24 hours of training through a certified Rehab Tech program - and you now become an assistant to the physical therapist in the Nursing Home PT Department. 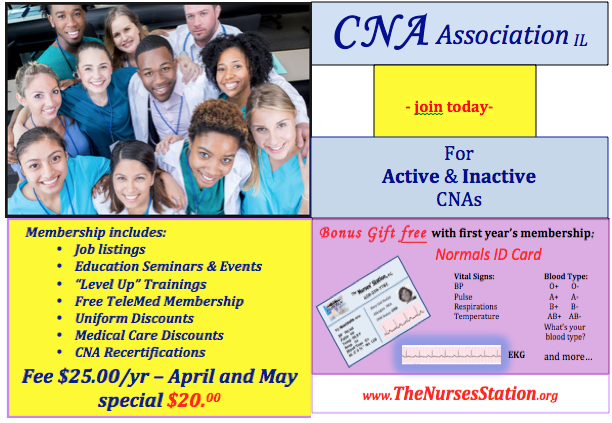 This organization is going to explore all of these with you - join and learn, get access to career development people and knowledgeable members of the healthcare team through your membership in the CNA Association of Illinois. Phlebotomy Training for the CNA - because of your education, training and probably your work experience, you can do the specialized 4-day phlebotomy training session - you don't have to do 2 semesters at a jr. college or 1 year at an allied health program to get your phlebotomy certification. And if you don't have 4 days, or the $685.00 all at once, you can do the 10-session training program that allows you to spread the training and the amount out over a period of time to be determined by you. Call us for the details.